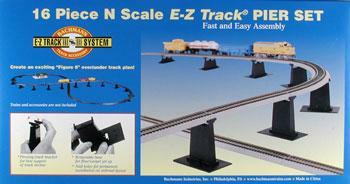 Use this 16 Piece E-Z Track Plastic Pier Set to create Exciting Over/Under Action to your N Scale Track Plan from Bachmann. These piers help you to create a "Figure 8" over/under track plan. Pivoting track brackets for best support of track incline. Removable bases for floor/carpet set up. Nail holes for permanent installation on railroad layout.